You are currently browsing the archive for the Trees And Plants category. These glorious flower meadows surround the Olympic Stadium. They are full of tiny flowers that don’t have much impact individually, but en masse they are almost too beautiful for words. Can you tell I love flower meadows? 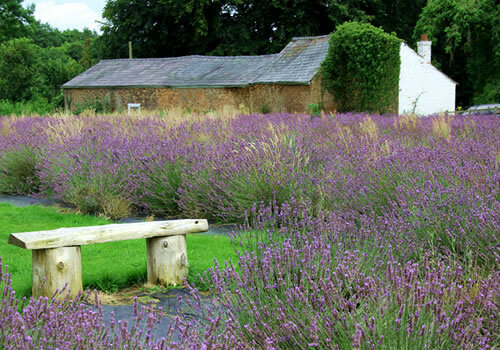 Full of vibrant annual flowers that grow from seed, flower and finish all in the space of a year. The vast meadows are the largest annual meadows ever used in a public park. Professors Nigel Dunnett and James Hitchmough created the Meadows in their role as the principal consultants for horticulture and planting design at the Olympic Park. 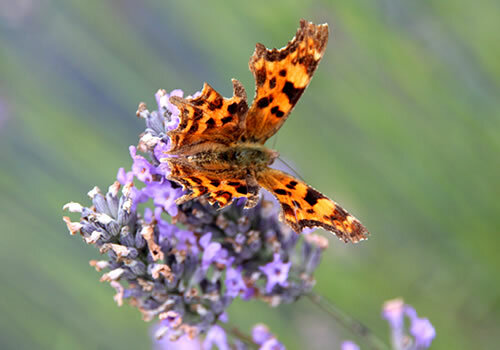 They developed an ambitious planting strategy for the site, which promotes biodiversity and sustainability. 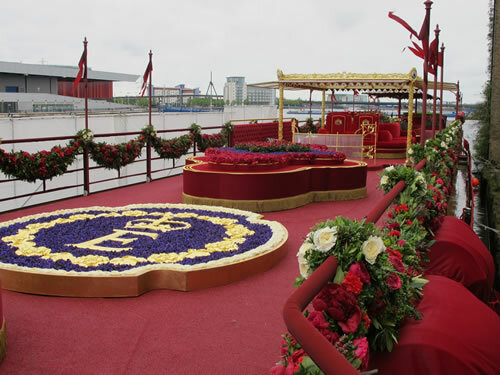 The park will be transformed for public use after the Olympic Games. The meadows are just one part of a huge planting scheme around the Olympic site. 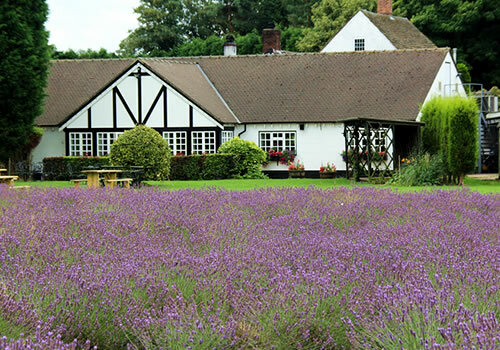 There were specific requirements for the meadows. 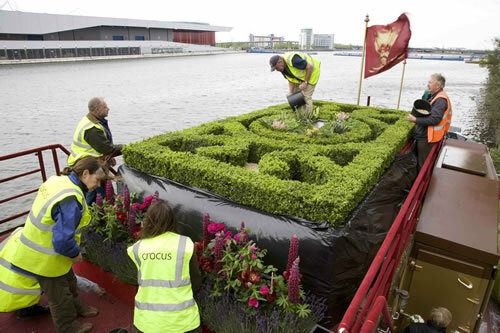 They had to be in peak flower for the opening of the games, look good before the games and continue to flower throughout the games and Paralympics. The colour requirements were yellow and gold, so the meadows could be known as ‘Olympic Gold Meadows’. The ground at the site was highly contaminated, so a clay cap was used to seal the contamination beneath. Sand and subsoil were layered on top, followed by top soil which the seeds were sown on. 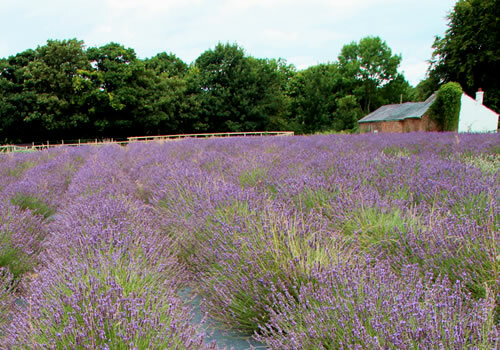 The planting sites were available in 2010 and 2011, so the site was sown to assess the quality and colour combinations chosen. Annual plants flower and finish within the same year so the meadow was started again for the Olympics. To sow the seeds they were mixed with sawdust, so the seed can easily be seen on the ground. The seed was sown by hand at a rate of 2g per square metre. The ground was then lightly raked and covered with biodegradable jute mesh to stop the rain washing the seed down the slopes. 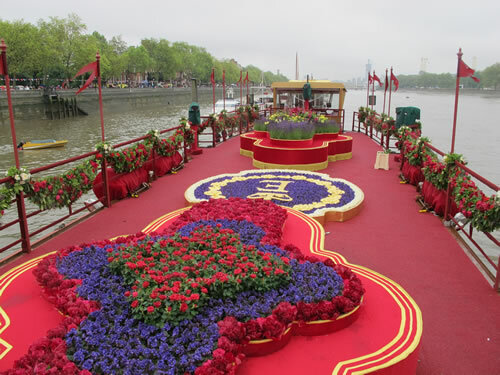 The seeds were sown in late April to early May to ensure the flowers were at their peak during the games. Native and non-native plants were used in the meadows. Main plants include Cornflower, Corn Marigold hybrids, Star of Veldt, Pot Marigold and Prairie Tickseed. The meadows were blue and orange earlier in the season and then gradually transformed to yellow and gold. 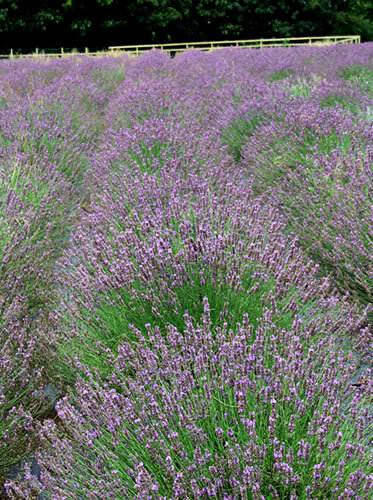 They will continue flowering until the frost in winter. The meadows are stunningly beautiful and will continue to delight visitors for months to come. Don’t forget the meadows will continue to flower after the Paralympics so you have plenty of time for a visit. You can read more about the meadows and the other gardens at the Olympic Park on Nigel Dunnett’s website. 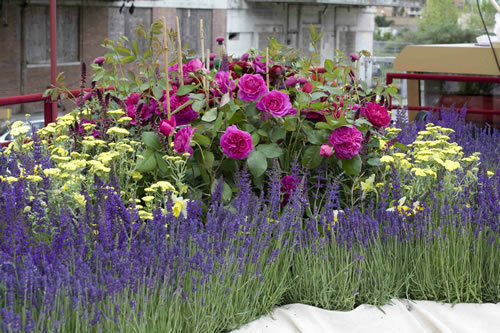 The RHS ran a Facebook competition recently to win tickets to an RHS show next year. There were some truly stunning entries. 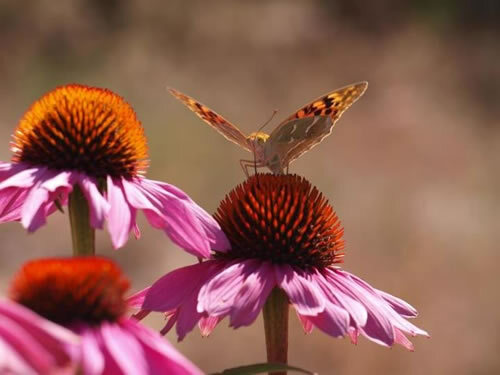 The image above of a fritillary butterfly on echinacea is one of my favourites, the colours are so vibrant. 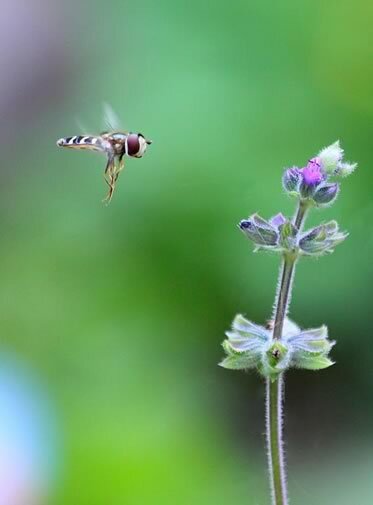 First place was awarded to Crow Corvine for this beautiful image of a hoverfly and a wild flower. This image was awarded second place, taken by Justin Miller. 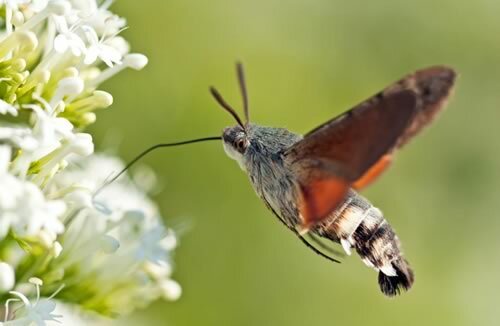 His amazing photo shows a rare hummingbird hawk-moth. 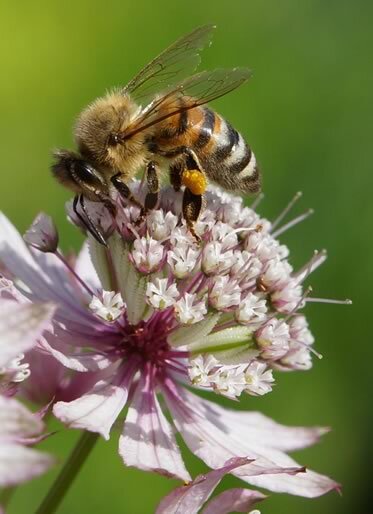 Third place was awarded to Gitte Hamann for this photo of a bee on astrantia major. I love close up images of bees, when they are buzzing about the garden you can’t really appreciate the detail of their wings or see how furry they are. You can see all the entries on the RHS Facebook page. Dracula Simia is the botanic name of these amazing orchids. 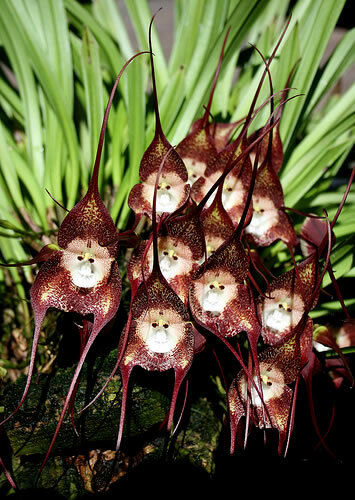 Botanist Dr Luer named them Dracula, which means ‘little dragon’. 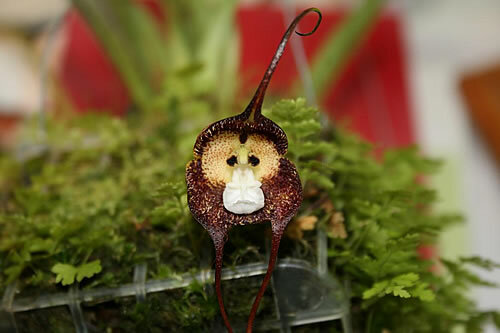 They are known as monkey orchids because of their striking resemblance to a monkey or baboon’s face. There are over 120 species which grow in the mountains of Ecuador and Peru, at heights of 1000 to 2000 metres. 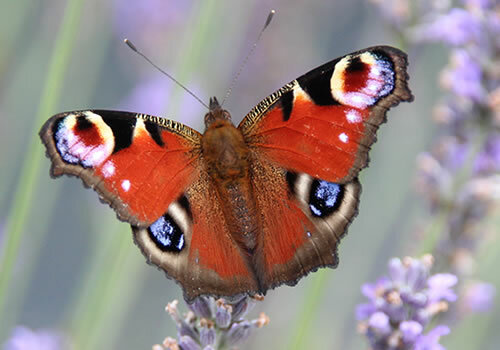 That is probably why they weren’t named until 1978 as they are hard to find, they are still very rare as cultivated plants. The orchids like cool humid conditions and have a scent of ripe oranges.